Frequent flyers of United benefit from a 50,000-mile bonus after spending $3,000 in the first three months of account opening. Additional travel perks are included with a rate of 1.5 United miles per dollar on all purchases. See more top airline credit cards. Check your first and second bag for free (a savings of up to $240 per roundtrip) when you use your Card to purchase your ticket. Enjoy Premier Access® travel services to ease your way through the airport with priority check-in, security screening (where available), boarding and baggage handling privileges. 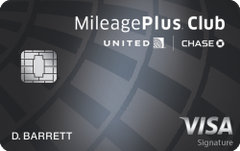 Our take: With its sky-high annual fee, most frequent United Airlines fliers would be smart to forgo signing up for the United MileagePlus Club card.